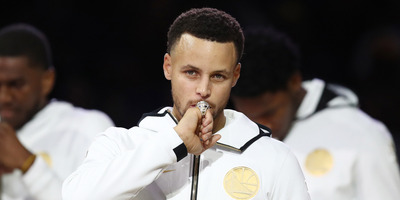 Ezra Shaw/Getty ImagesJust one game into the 2018-19 NBA season, Stephen Curry and the Warriors once again feel like an unstoppable force marching towards another title. The Golden State Warriors opened the 2018-19 NBA season on Tuesday night with a 108-100 win over the Oklahoma City Thunder. Warriors superstar guard Stephen Curry had one of his most dominant all-around nights in years, putting up 32 points, nine assists, and eight rebounds to lead Golden State to victory. The game was a prime example of why the Warriors are the most dangerous team in the NBA – they can beat you on any night in a myriad of ways. It’s no secret that the two-time reigning champion Golden State Warriors are once again the favourites to dominate the 2018-19 NBA season, but one game into the year, Stephen Curry is already showing how opposing teams might still be underestimating him. The Warriors opened their season on Tuesday night with a 108-100 win over an Oklahoma City Thunder team that was missing Russell Westbrook. The game was by no means a rout, but Curry was a dominant force throughout his 37 minutes on the court, putting up 32 points, nine assists, and eight rebounds for one of his best all-around statistical performances since his MVP seasons in 2015 and 2016. Curry killed the Thunder with every trick in his arsenal, opening the game with an easy corner three. Including the playoffs, Curry posted six games during his 2015-16 MVP season in which he scored 30 points and had at least 8 rebounds and 8 assists. This was just the second game since that season, with the other coming in the 2017 Finals. The performance suggests Curry is as healthy and motivated as ever, a bad sign if some in the NBA were hoping for a less-than-peak Warriors team. He continued to bewilder the Thunder defence throughout the game, using his superb handling to find space from the crowd to get up a jumper. Steph Curry handle ➡️ Steph Curry pull-up! 32 PTS for the @warriors point guard. And his most impressive plays likely came when he was pirouetting through the lane for layups and floaters. While Curry showing out with a brilliant game might not be the most surprising development to start the basketball season, what makes the move so scary to other teams in the league is the fact that with it, the rest of the Warriors were able to coast to a victory despite relatively off nights. Klay Thompson shot just 25% from the floor on Monday, and aside from Curry, the Warriors were a dismal 2-of-17 in their three-point shooting. When Curry is playing to his MVP level, it doesn’t matter. When Kevin Durant first came over to the Warriors two seasons ago, Curry’s role as lead scorer downshifted a bit, in favour of becoming a more team-centric facilitator. He could still turn it on if the Warriors needed, but they rarely did, and through two years Golden State largely coasted to championships. On Tuesday, Curry flexed his muscles as a reminder that he still has another gear in him – similar to the likes of LeBron James, James Harden, and his teammate Kevin Durant, Curry is capable of taking over games himself and willing a team to victory almost single-handedly. For most teams, this is the role of the superstar – alongside one or two other great players and a well-rounded team of role players, LeBron and Harden can compete with almost any other team in the country for 48 minutes. On the Warriors, three or four different players can take on the role, and it’s a terrifying proposition to teams hoping to take down the champs this year. Curry showed on Tuesday he still has that extra gear, and alongside him is Kevin Durant, Draymond Green, and Klay Thompson. In a few months, DeMarcus Cousins will be suiting up for the Warriors as well, just in time for Golden State to start planning out their postseason push. There’s plenty of compelling teams to follow in the NBA this season, but if Curry decides he wants to play for another MVP award this year, the rest of the league is doomed.